Did you grow up with this Classic Lipton’s Onion Soup Dip made from Lipton’s Onion Soup Mix and Sour Cream? I did, and we considered it a real treat at our house. Served, of course, with Lay’s Potato Chips, the ridged ones. Or maybe it WAS Ruffles, as Kathryn pointed out in her comment. I don’t think Lay’s Wavy was out way back when in the ’60’s! I guess it doesn’t matter, because you can serve your Classic Lipton’s Onion Soup Dip with either – or with other things, too. Maybe some veggies or those little crostini you can buy at the store. I dunno, whatever you want. I’ll have my Lipton’s Onion Soup Mix with chips! It’s been years, decades even since I’ve made or even tasted this Classic Lipton’s Onion Soup Dip, so I couldn’t resist trying it out with my home-made version of Lipton’s Onion Soup Mix. I went a little cray cray with my Homemade Lipton’s Onion Soup Mix and have made a few classic old school recipes. I made Mom’s Pot Roast and that slow cooker recipe for BBQ Pork or Brisket, too, and they were better than I remembered. So what was the verdict on this Classic Lipton’s Onion Soup Dip? Well, it elicited an enthusiastic little moan from my 86 year old Dad. I’ll take that as a “yes” vote. And me? I was like, “Dang. It really IS good.” Yeah, food snob me was surprised that something so old school, something so easy to make could be so good. And so easy it’s dangerous…be sure to use a great sour cream for the best results. I’m not sure if it was my homemade Lipton’s Onion Soup Mix that really gave this dip a bit of an edge, but I’d like to think so! (You can make this with the Lipton’s Packet, too!) That homemade Soup Mix is a super easy recipe, too – it’s just a matter of having the ingredients on hand, so you’ll want to check that you do. For instance, normally, I don’t have onion flakes in my pantry, or at least I didn’t before I started making the soup mix. Now I always have those onion flakes! So there is nothing to making your Classic Lipton’s Onion Soup Dip. Just mix it up, taste it and make sure you put just the right amount of the mix in the sour cream for your tastes and let it sit for a while. Preferably about an hour or so in the fridge if you can stand to wait. That softens up those onion flakes a bit and melds all those flavors together. Do you live in one of those areas of the country where the only sour cream you can buy is the thinner sort? That used to be the case here in Minnesota, so I don’t know if that’s a thing where you live. If it is or if you don’t want to shell out the big bucks for a premium brand of sour cream, line a strainer with a paper towel or cheesecloth and strain it in the fridge for an hour or more until the consistency of your sour cream is nice and thick. First of all, Classic Lipton’s Onion Soup Dip beat the pants off any store-bought dip I’ve had…and was much cheaper! The mark up on a store bought dip is incredible. Watch for sour cream on sale, usually around every holiday. Sour cream keeps for weeks and stays fresher if it is stored upside down. It might be a bit messy when it’s opened, but try it and see if you don’t notice a huge difference in the freshness. As far as the actual Lipton’s Onion Soup Mix for this dip, check for your spices and herbs in the bulk section of the store and they may very well cost less. As far as the buillion in the Lipton Soup Mix, the best part of this is that you can control the ingredients. Go for something inexpensive or if it’s your jam, go for high end organic. And if you don’t want to make your own Lipton’s Soup Mix, you’re always welcome to just buy a packet. Now, I’m not going to ever imply that Classic Lipton’s Onion Soup Dip is an absolute match to my recipes with the slowly cooked for about an hour caramelized onions, but it has a definite place in my repertoire of Onion Dips – and I know I’ll probably be making my Classic Lipton’s Onion Soup Dip a lot more often than those that take so much work and time. If you’re looking for something a bit more sophisticated than Classic Lipton’s Onion Soup Dip, and have a bit more time on your hands and don’t mind caramelizing onions, check out my Caramelized Onion Dips. You can follow the links at the bottom of the page, too. One version is a definitive classic Caramelized Onion Dip, another has bacon – yes, bacon! The last is my healthier skinny Caramelized Onion Dip made with Greek yogurt. 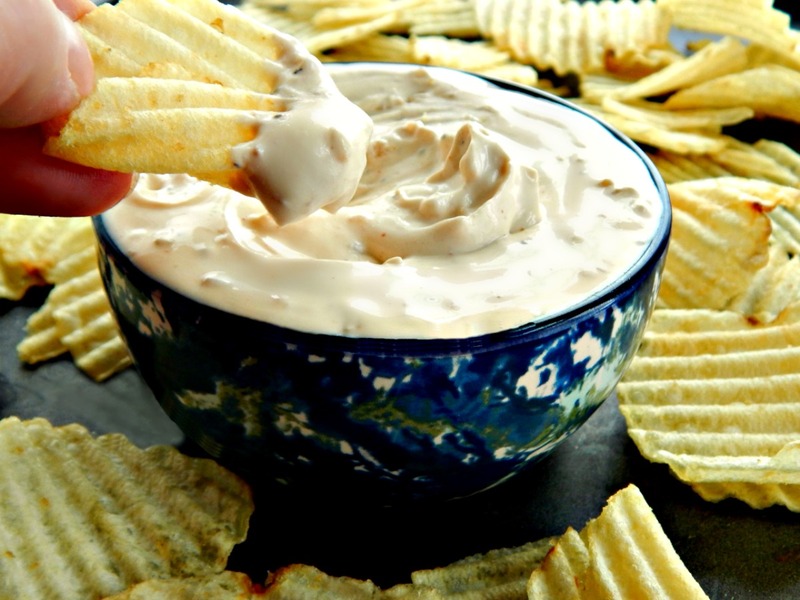 The Classic, cool creamy dip! Mix together, chill if desired. If time allows, let sit for 30 minutes to an hour in the fridge before serving. So easy you hardly need a recipe, but sometimes we all need a memory jogger! Which is better, Ruffles or Lays? Check out this scientific video! I’ll be bringing this dip over to Angie’s Fiesta Friday #157, co-hosted this week by Andrea @ Cooking with a Wallflower and Su @ Su’s Healthy Living. Thanks, ladies, for making this link party possible! This entry was posted in Click here for Fabulous Food Posts and tagged Appetizer, home-made onion soup, lipton's onion soup mix, onion dip, Sour cream, Spreads and Dips. Bookmark the permalink. They passing out samples at Costco. The rep said mix half sour cream and half mayo but box just says add half cup mayo. So do u cut down half on the sour cream? Emily, hi…sorry I wasn’t right on this answer…no, I always use just sour cream…. So nostalgic Mollie!! I do snacks for our young adult group that comes in on Monday nights– I bet they’d love this! Your recipes are always to practical and useful! thanks! Thanks, Rhonda! I used to be quite a bit more non-traditional, but when I’m feeding a 90 and an 86 year old I figure they get what they want!! I love onion soup. Your recipe sounds so delicious, I have to try it. Thanks for the inspiration! Lina, I’m so sorry – I saw this and forgot to answer. How rude of me!! Hope it went well! Hi, just wanted to stop by and say ‘hi’. I was wondering if you may have a great potluck recipe. I’m searching for one for a potluck party in two weeks. Thanks .. I almost always bring either my Banana Sheetcake or Chocolate Sheetcake if I’m doing a dessert, and my fave main dish dinner for a potluck has got to be hands down the Shredded Mexican Style Pork which can be also made with beef. Sometimes I like to bring fruit salads to potlucks, but not usually this time of year – the fruit isn’t very good & its expensive!. Time for a taste off! I loved that dip, it was very moorish as my mother would say. I think I ruined many a dinner appetite. Just in time for super bowl Sunday. Do you remember using that dried soup to flavor a pot roast? Oh yes I do – and I just made one, lol!! Recipe coming…I think it will be a great one for my son & his g/f to make. 🙂 And it was surprisingly good! What a delicious blast from the past. Mega hugs! looks good! 😀 your photography has significantly improved. Oh, nooooo, tell me it isn’t so!! You’re a Ruffles girl…?? lol! See, goes to show we all have our deep dark secrets! lol! I’m quite sure you’re right…but I do remember all the years I lived in Colorado and couldn’t get any Lays at all – even though the commercials always went on and on…”Lays potato chips, no one can eat just one…” Then we got Lays and it was a miracle! Regular or Wavy!! Do you suppose they’re the same thing, ruffles and lays? The missus used to make this all the time! Thanks for a great memory! Junk food at it’s finest, lol! 🙂 I couldn’t help but post it…. Love that dip! We’ve been making it for a long time.